You’ve probably seen this root at your International Market,but never really cared for it, but now it comes also in powder forms, and also pills and beauty items, that can make turmeric more pleasing to incorporate and use in the daily life. 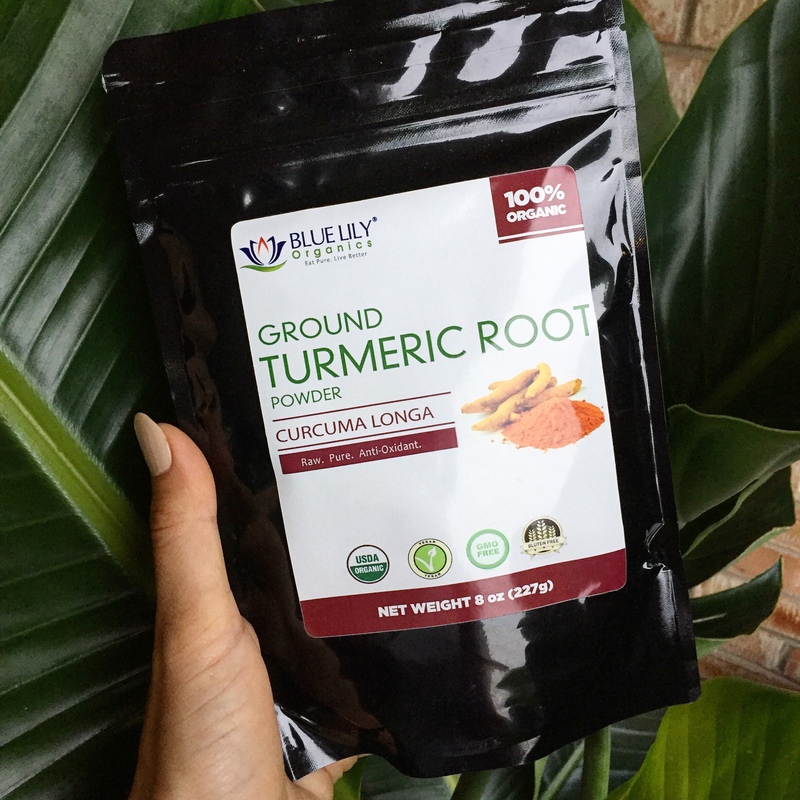 This powerful root it has deep roots in India,where you probably know the color yellow in curries is turmeric used as spice, but they also use it as medicinal purpose. Curcumin is the main active ingredient in turmeric. It has powerful anti-inflammatory effects and is a very strong antioxidant,a blood tonic, an emmenagogue (stimulates blood flow), and a carminative (relieves gas). It promotes ovulation in women, is great for the skin, and is antibacterial, antifungal, and antimicrobial. It’s also a blood thinner and blood detoxifier, and will aid in eliminating worms or parasites. And it’s a pain-killer that also speeds up the healing of wounds. Turmeric has been shown to help in recovery from chemotherapy, may help prevent specific types of cancer, and can ease the effects of psoriasis and arthritis. Currently I’m using Organic Turmeric Root Powder by Blue Lily Organics ,very aromatic and intense. Golden milk. Bring to a boil 2 cups of milk or unsweetened almond milk with 1 teaspoon powdered turmeric and 1 teaspoon powdered ginger. Turn off heat, let cool for a few minutes, and add 1 tablespoon of raw honey. If you’re drinking it before bed, add ½ teaspoon each of nutmeg, cinnamon, and cardamom to the mixture to promote a good night’s sleep. Optional: Add 2 teaspoons coconut oil. Turmeric tea. Dissolve 2 teaspoons powdered turmeric in 2 cups boiling water, and add 1 tablespoon of raw honey, the juice of a lemon wedge, and a sprinkle of black pepper. Smoothie. Add turmeric to your favorite smoothie. A teaspoon will be beneficial without changing the taste of your beverage too much. More foods recipes. Turmeric can easily be incorporated in curries, marinades,rubs,sauces,salads, soups and baking goods. As a supplement. I’m currently taking a supplement by Taj Valley or Organic Turmeric Curcumin with Black Cumin, that is used to support joint movement, immune and heart health, and much more. In a moisturizer. This balm like amazing moisturizer by Sanre Organic Skinfood is C-Love that has many potent extracts that seriously heal the skin, moisturize and has potent anti-aging power. As a mask. Currently loving Dirty lamb Organic Turkish Coffee Mask,a coffee scrub with the power of turmeric as a mask, that has powerful benefits agains acne and tired skin. Body scrub.Mix 1 cup sugar, 1 teaspoon turmeric and 1 tablespoon coconut oil. As an eyeshadow. As tempted that I’ve been in the past,I must say I don’t recommend turmeric in pure form for this purpose, since is staying skin and clothes, but it can be definitely be mixed and included in many makeup recipes, to give natural warmth. Are you incorporating turmeric in other fun way?